Today returning author Cristelle Comby takes over our blog to tell us about outlining! 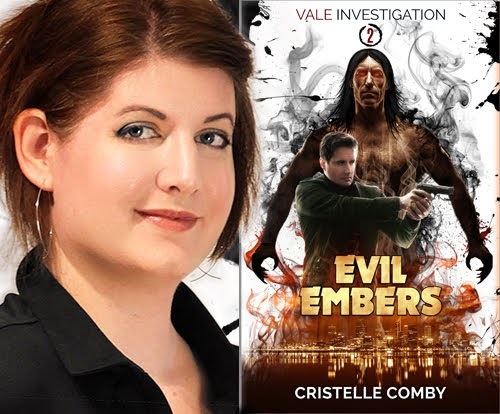 Her latest release is Evil Embers (1 Mar 2019, Cristelle Comby, 226 pages), an Urban Fantasy, book two of Vale Investigation series. "I loved the first book in this series, and the second didn’t disappoint. I hope Bell continues to have more cases and adventures. Outlining, to writers, is the process of setting out the main events of your book and working out the plot from beginning to end. It is a plan of your novel before you begin to write. It can be from a rough single page on how the plot works, or a series of post-it notes put into order for writing. I personally take great care to outline the whole story before I even write the first word of a novel. It is a document that follows me throughout the entire process. It’s a very lively document: it undergoes constants edits, shrinks in parts, toughens in others. There is no starring at a blank screen wondering what to write. When you sit down to write, you know what to write about next. You won’t get so lost and end up down a blind alley with your plot. Change your plot or incorporate new ideas. If you plan it out, you can see ways to enhance the plot and add in new ideas. As you research, you will know where to put them in or what to change. And lasts, and more importantly, if you’ve carefully outlined your story, it means that you know how it ends. I made the mistake, once, of starting out writing a story without having a clear idea of how it was going to end. Some 300 pages later, I ran out of ideas and now, several years later, that story still sits unfinished in one of my desk’s drawer. specializes in the weird, wacky, and slightly unhinged..